My next recipe for Campbell’s is their Quick Chicken & Noodles. While the original recipe calls for several different types of vegetables, you are free to sub in your own. I had a large bag of delicious snap peas and the thought of chicken, crispy peas and cream of mushroom soup totally worked for me. 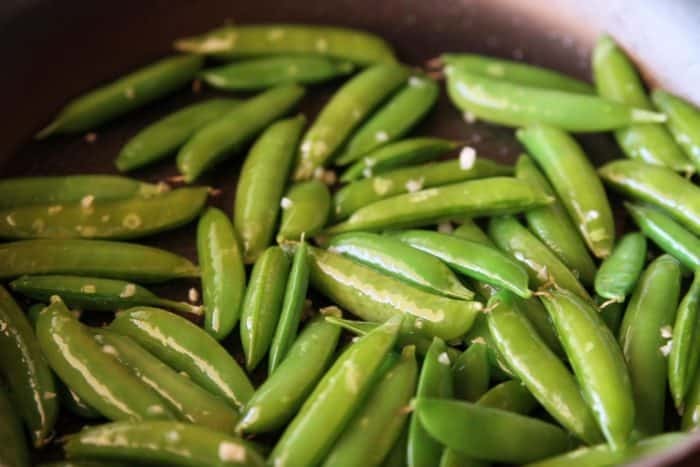 I love how large snap peas fry up, I must admit, I am not a snow pea fan. Once you try snap peas, you’re never going back, trust me. Snow peas are a tasteless shadow compared to how amazing large and in charge snap peas taste in a stir fry or a quick dish like this. Sorry, snow peas, I’ve fallen out of love with you. 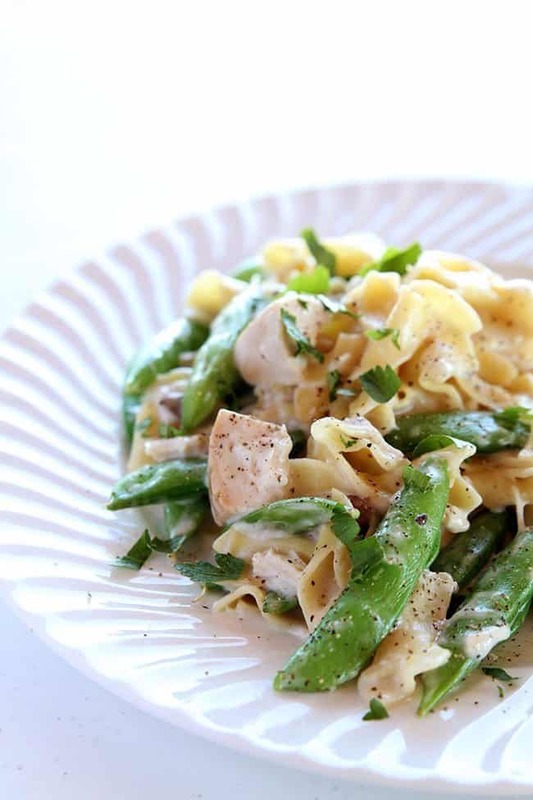 I love recipes that use up cubed chicken, because either you are using leftover chicken from the night before or you can grab yourself a deli chicken and whip up this dish. You have the choice of cream of chicken soup or cream of mushroom and as you all know, I love anything that has cream of mushroom. I also think that mushrooms and peas are a match made in heaven taste-wise, but chose the flavours you want to pair together. 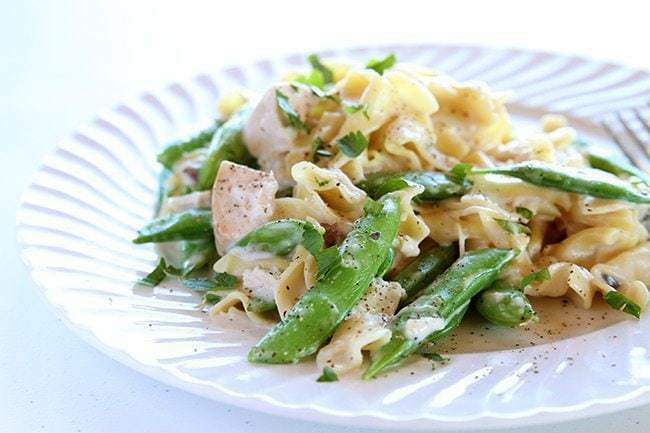 Creamy chicken and noodles with snap peas. Fast, easy and delicious. Heat olive oil in a large skillet set over medium heat. Add mixed vegetables, and garlic. SautÃ© for 3 to 5 minutes or until tender-crisp. Stir in chicken, soup and milk; bring to a simmer. Cook, stirring, for 3 to 5 minutes or until chicken is heated through. Stir in noodles, parmesan, lemon juice, and pepper; return to a simmer. Remove from heat and stir in parsley.